Lighting the Torch of St. Benedict in the presence of Archbishop Renato Boccardo of Norcia, Italy, and by the abbots of the Montecassino and Subiaco, in the CoCathedral in Malta. Every year since 1964, when Pope Paul VI declared St. Benedict a patron of Europe, the Torch of St. Benedict has been lit in one of Europe’s major cities. It has been lit in Berlin, Prague, Bucharest, Strasbourg, Budapest, Madrid, Lisbon, Warsaw, Brussels, Vienna, London, Moscow and Jerusalem. In 2001 the torch was carried to New York, to be lit there as sign of solidarity after the terrorist attacks of September 11. Since 1992, it has been designated also as a Torch of Peace as well as European Unity. The torch is intended to symbolize the fraternity and peace proclaimed in the Gospel, beyond all political, ideological and religious divides. 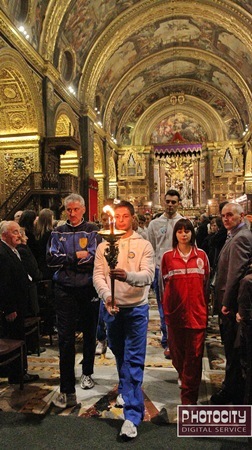 The Torch was lit this year on the tiny island of Malta on Sunday 4th March 2012; Archbishop Paul Cremona O.P. lit the Benedictine Torch for Peace during a Eucharisitc Celebration at St John’s CoCathedral in Valletta. From Malta, it was taken to Rome, where it was blessed by Pope Benedict. Some reports say that the Torch has completed its tour of European cities; all agree that it is going home. Even there they differ: some say that it is going to Norcia, the walled town high in the mountains where St. Benedict was born. Others say it is going to Montecassino, the abbey built high on a hill a few hours south of Rome – the place where St. Benedict finished writing his Rule and where he is buried along with his sister St. Scholastica. Whatever its destination, I hope the torch is kept in a handy location. The world needs more rituals and ceremonies of peace and unity to draw us together. Having completed its rounds of major European cities, the torch is now being returned to Norcia, the home of St. Benedict. Catholics, Christians, Benedictines–we should be beacons of light and torches of peace for the world around us. I recently read a post on Facebook by a man who said he was finished with Christianity because of the way he sees so many Christians behave. While Christianity and Catholicism should be judged according to those who DO follow its tenets, and many people call themselves “Christian” by default in that they aren’t Jewish or Buddhist or something else, that man gave me pause. Any time I don’t live up to what I proclaim, I am a scandal to those who are watching. It isn’t enough simply to bear the name. Of course, there are those who will dismiss us when we DO live our beliefs about abortion, the sanctity of marriage, sexual morality, etc., because society as a whole has rejected those things. But that’s the other side of the coin.